Leopards are solitary animals; but not in northwest India. In a remote, little-known region of Rajasthan these majestic big cats display astonishing behaviour. The leopards live close together on rocky hills, and they frequently interact. They use caves as sanctuaries and rather than carry their prey into trees, they deposit it in the caverns. Their habitat, a large plain sprinkled with ancient rock formations, is unique and starkly beautiful. The rocky hills are part of the Aravalli mountains, geological relics of the oldest mountains on the Indian subcontinent. 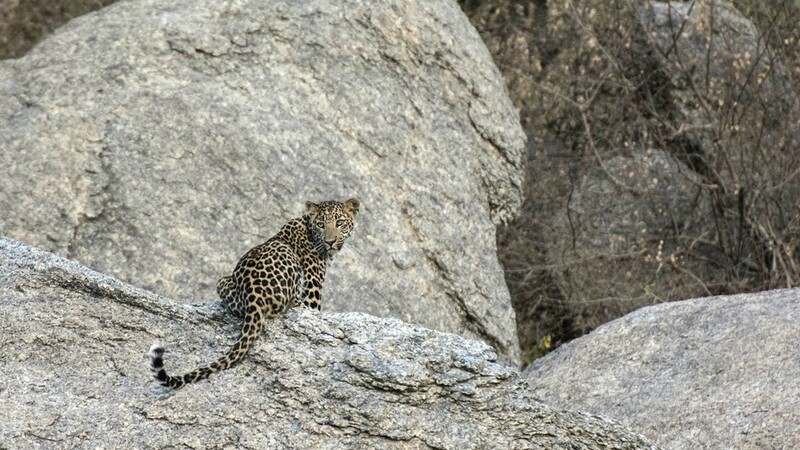 The leopards share their rocky territory with families of monkeys and wild peacocks, as well as with the inhabitants of the nearby villages. These villagers visit the many different temples built into and on top of the rocks every day – and yet, no human being has been attacked by a leopard here in decades. The farmers and herdsmen who guard their animals have learned to live with the big cats over centuries. It is a largely peaceful co-existence between humans and leopards – a rarity in modern India. ‘The Leopard Rocks’ follows Neelam, a female leopard, as she fights to protect the lives of her cubs. Locals call the rock formation where Neelam lives, Jagtala. This is where she was born and learned to hunt from her mother. Now, Neelam has become a mother herself. 3 months ago, Neelam gave birth to three cubs, two males and a female. The cubs are still dependent on their mother’s milk, but they are growing increasingly playful and curious. They regularly leave the safety of the cave to explore their surroundings – under the watchful eyes of their mother. During these brief excursions, they have to rely on Neelam’s experience and instinct, as danger lurks behind every rock. There are striped hyenas, who are on the lookout for fresh meat for their own offspring. An even greater danger are adult male leopards on the hunt for a female to mate with, and a new territory. These solitary animals threaten the leopards that have settled among the rocks. The battles for supremacy between the males can have lethal consequences for leopard mothers like Neelam. When the father of her cubs is killed and a new leopard takes his place, her offspring are in mortal danger; no longer safe in the caves and recesses of the Jagtala hills.